Cycle Race with Shiva, Reva, Uday, Aditya and Ladoo Singh with awesome Bicycle Physics and stunning 3d graphics environment. 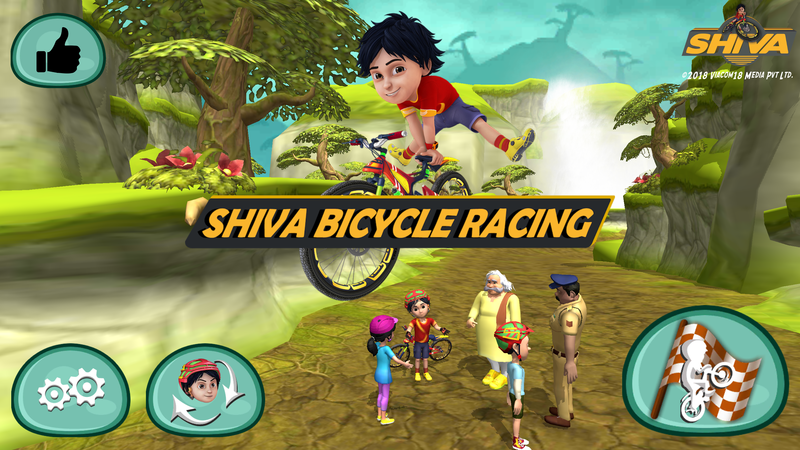 It's Happy and adventurous time for all Shiva fans to experience the best cycle racing game with Shiva characters. Race against time in a friendly match with Shiva, Reva, Uday, Aditya and Ladoo Singh !! Shiva Cycle race is the best possible blend of art, technology, and innovation. Reinforcement machine learning has been implemented to learn, drive cycle and compete by opponents against the main player. Download and Play yourself to experience this awesome game. Shiva is an Indian animated cartoon action television series currently airing on Nickelodeon Sonic and Nick HD+. Note: Shiva characters and Logo are copyright of ©2018 Viacom18 Media Pvt Ltd and Someshwara Software Pvt Ltd (OPC) purchased the license for mobile gaming. Shiva Bicycle Racing is India only release targeting only Indian audience. Implemented Timeline and Cinematics feature to create a sequence for the introduction of the game..